Israel HAZEN (1701 – 1784 ) was Alex’s 7th Great Grandfather; one of 256 in this generation of the Miller line. 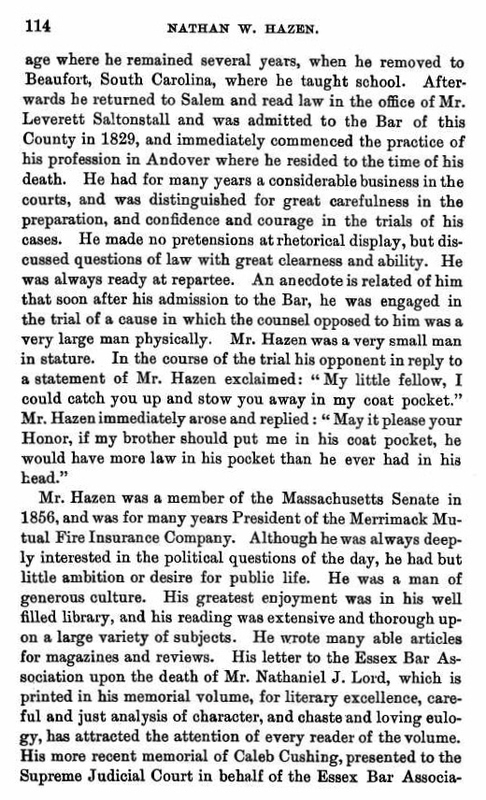 Israel Hazen was born 20 Jul 1701 in Rowley, Mass. He was baptized 27 July 1701. His parents were Edward HAZEN II and Jane PICKARD. He married Hannah CHAPLIN on 27 May 1724 in Rowley, Mass. After Hannah died, he married Jane Bailey on 18 Jun 1761 in Rowley. Israel died on 2 Jan 1784 in Rowley. Hannah Chaplin was born 20 Feb 1701/02 in Rowley, Mass. Her parents were John CHAPLIN and Margaret BOYNTON. Hannah died 10 Jun 1760 in Rowley. Jane Bailey was born 4 Feb 1706 in Bradford, Essex, Mass. Her parents were Thomas Bailey and Eunice Walker. She first married John Harriman on 7 May 1726 in Rowley. Jane died 8 May 1803 in Rowley, Essex, Mass. 3. Hepzibah Hazen 6 Sep 1730 Boxford, Mass. On July 15 1729, for parental love and affection, Edward Hazen of Boxford (with his wife Jane assenting by mark) conveyed to his son Israel Hazen about seventeen acres in Rowley, and “one half of ye Dwelling House which I live in, and one half of ye Barnwhich I improve,” reserving a way across the land for himself and his heirs. On 16 Feb 1761, “Israel Hazen of Rowley, wheelwright, for love, good will and parental affection,” gave to his son Jacob Hazen of Rowley, cordwainer, half of all his land in Rowley and half the buildings thereon, and half of his land in Boxford, and half of his land in the County of Middlesex. Israel Hazen was a Sergeant in a company which served at Lake George and vicinity, 7 Aug. to 17 Dec. 1755. He and his son Jacob were Privates in Capt. Richard Thurston’s Train Band in Rowley in 1757. Jacob’s wife Abigail Perley was born 28 Dec 1732 in Boxford, Mass. Her parents were Amos Perley and Margaret Cogswell. She first married 1 Nov 1750 in Boxford, Essex, Mass. to William Spofford (b. 18 Oct 1730 in Rowley, Essex, Mass.) and had three children between 1851 and 1853. Sergt. He was “of Boxford” at the time of the publishment of his ;marriage. His farm was in the East Parish, on the edge of Rowley. He enlisted, 15 Feb 1775, in Capt. William Perley’s Company of Minutemen, Col. James Frye’s Regiment, (10th Massachusetts Regiment), which was in service seven days at the time of the Lexington Alarm, 19 Apr. 1775. Return of men in camp at Cambridge dated May 17, 1775; Disbanded December 31, 1775. Most of Frye’s regiment was assigned to Col. Prescott and worked to build and defend the redoubt and adjacent breastwork at Bunker Hill, but I can find no evidence Perley’s Company was included. One source cites Frye as being sick at the beginning of the battle and not with the men, another has him wounded during the battle. The estate of “Jacob Hazen of Rowley ” was administered by his son Jacob, 8 Nov. 1796; the inventory amounted t o $1101.14. A receipt was given to Jacob Hazen, administrator of “the Estate of our honored Father Mr. Jacob Haz en, ” 21 Nov. 1796, by Israel Kimball, William Hazen, Thomas Dresser, and Jona. Dickinson. Jacob and Abigail’s children William, Jacob, Hannah, Enoch and Josiah were all original settler of Brigton, Cumberland, Maine, today a resort area in Maine’s Lakes Region. The undeveloped land was first called Pondicherry. It was granted in 1768 by the Massachusetts General Court to Moody Bridges and a group of proprietors. Settlement began in 1770 at what is now North Bridgton, where a tavern was built. The community was organized in 1779 as Bridgetown Plantation, named after Moody Bridges, and then incorporated on February 7, 1794 as Bridgton. Stevens Brook is only a mile and a half long, but it provided water power for 12 mill sites. It developed as an industrial center, with sawmills, gristmills, woolen textile mills, a tannery, shoe factory and brick manufacturer. Later, a corn and vegetable packing plant was built, in addition to a foundry, machine shop, shovel handle factory, sash and blind factory, and a coffin shop. Population increased when goods manufactured by water power could be transported to outside markets on the Cumberland and Oxford Canal, which opened to Portland in 1832. By the mid-19th century, the town contained about 3,000 inhabitants. m2. 27 Nov 1834 at the age of 68 Sweden, Oxford, Maine to Sophronia Bumpus (b. 17 Jun 1803 in Randolph, Maine – d. 15 May 1892 in Norway, Oxford, Maine) Sophronia’s parents were Silas W. Bumpus (1781 – 1839) and Keziah Packard (1779 – 1874) William and Sophronia had two children: John Bunyan (b. 1836) and Maria Theoda (b. 1840) She married third, John Merrill. 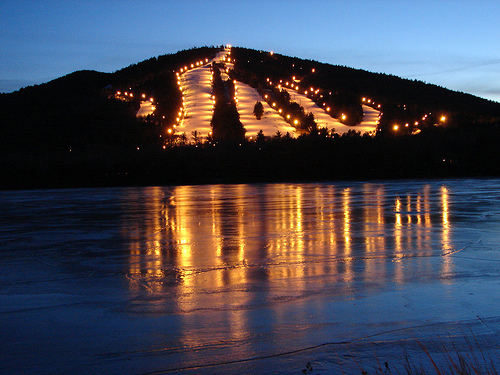 William settled in Bridgton, Maine, as early as 1794, and in numerous deeds there is styled “William Hazen, Gentleman” (while his brothers were call “yeomen”). His farm was just north of that of his brother Enoch, and in 1908 was owned by George Hilton, who stated that he was a man of considerable wealth, but lost his property through lawsuits and other misfortunes. By his last Cumberland deed, “William Hazen of Bridgton, yeoman” sold to Jacob H. and Richard Kimball, both of Bridgton, joiners, the land and buildings where he then lived, for $650.00. According to an old account, he was a colonel in the state militia. ; He was probably a deacon in the Baptist Church of Bridgton, and it is said that some of his property was expended in avoiding a suit that might bring discredit on this office. He and his second wife were “both of Sweden” at the time of their marriage, but there is no record of his estate in Oxford County, and he has no deeds recorded at Paris. Called New Suncook Plantation, Sweden was granted by the Massachusetts General Court in 1774 to the officers and soldiers (or heirs) for their services to the state. In 1800, the town was incorporated as Lovell after Captain Lovewell. ii. Sgt. Jacob Hazen b. 22 Oct 1762 in Boxford, Essex, Mass; m. 4 Dec 1798 to Hannah Wood (b. 2 Feb 1764 in Boxford, Essex, Mass. 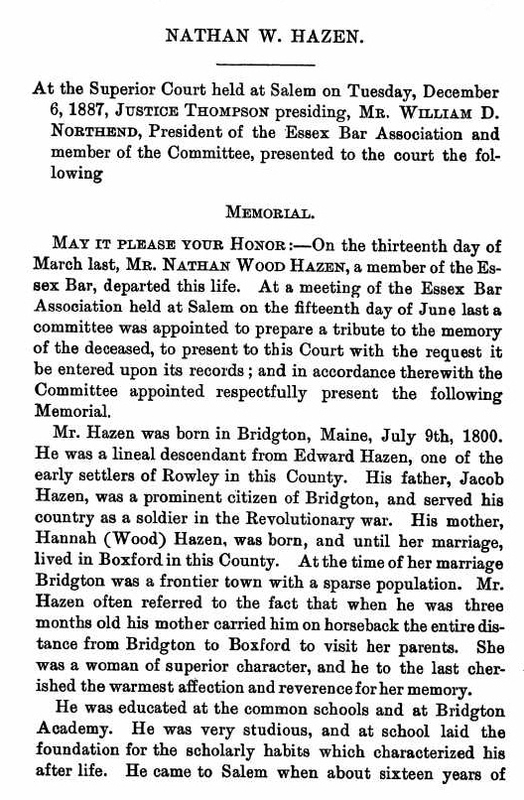 – d. 22 May 1840 in Bridgton, Cumberland, Maine) Hannah’s parents were Nathan Wood and Elizabeth Wood. Jacob and Hannah had six children between 1799 and 1810. Hazen, Jacob, Jr. Receipt dated Boxford, May 5, 1781, for bounty paid said Hazen by Class No. 4 of the town of Boxford, Asa Perley, Chairman, to serve in the Continental Army for the term of 3 years. Jacob Hazen, Jr., of Boxford, Mass., yeoman, bought of Richard Peabody of Boxford, gentleman, for 45 pounds, the sixth lot in the seventh range in Bridgton, Cumberland Co., Mass. [Maine], 4 March 1785; this land he sold to his brother Enoch, 3 March 1797. The names of Jacob and William Hazen and Israel Kimball are on a list of the inhabitants of Bridgton in 1794, but not on a list dated 31 Dec. 1787. Richard Peabody of Boxford, gentleman, sold to Jacob Hazen of Bridgton, for $30, a lot on the easterly side of Long Pond in Bridgton, drawn on the 63rd right, originally owned by William Bennett, 1 Feb. 1796. He kept a tavern at North Bridgton before 1800.
iii. Hannah Hazen b. 3 Jul 1764 in Boxford, Essex, Mass; d. 23 Apr 1822 Bridgeton, Cumberland, Maine; m. 15 Nov 1791 in Boxford, Essex, Mass to Thomas Dresser (b. 7 Aug 1762 in Boxford, Essex, Mass. – d. 10 Apr 1823 in Bridgeton, Maine) Thomas’ parents were John Dresser (1735 – ) and Jane Bailey Harriman (1741 – 1788). This Hannah Hazen was celebrated as the “witch” of Spofford’s Hill, in Georgetown. She was involved in something called “the notorious meal-chest affair on Spofford’s Hill, Georgetown”, but I haven’t discovered what that was. Thomas Dresser of Boxford, Mass., blacksmith, purchased 14 Sept. 1802 of Joseph Sears in Bridgton, eight acres together with the shop lately erected by Timothy Frisbie on Mill Brook, with a sufficient quantity of water to carry a trip hammer, bellows and grindstone. In 1807 Thomas Dresser “of Bridgton” and wife Hannah sold a portion of this land, and 4 Mar. 1823, “Thomas Dresser of Bridgton, wool carder,” and Hannah his wife sold another portion to Uriah Gibbs. On 24 Aug. 1827, John Dresser, Joseph Dunnels and Rebecca his wife in her right, James McLellan, Jr., and Eunice his wife in her right. all of Newfield, County of York, and Abner Dole of Limerick and Lydia his wife in her right, sold to Jefferson Brigham of Bridgton, all their title to a carding machine building, as heirs of Thomas Dresser, late of Bridgton, blacksmith, deceased intestate. No children. v. Enoch Hazen b. 9 Mar 1770 in Boxford, Essex, Mass; d, 08 Feb 1853 in Bridgton, Maine; m. 09 Feb 1797 in Boxford, Mass. to Martha Thompson (b. 16 Oct 1774 in Deer Isle, Maine – d. 19 Apr 1860 in Lovell, Maine) Martha’s parents were Thomas Thompson and Foster. Enoch and Martha had eleven children born between 1797 and 1813. On Mar 3 1797, Enoch Hazen of Bridgton, yeoman, bought of his brother, Jacob Hazen of Bridgton, yeoman, for $1,200.00, lot number 6 in the 7th range in the first division. This was the farm about two miles north of Bridgton village on the Sweden road, where he always lived. Part of it was owned more recently by his grandson, Walter S. Hazen. vi. Phebe Hazen b. 3 Dec 1772 in Boxford, Essex, Mass; d. 20 Nov 1854 in Bethel, Maine; m. Israel Kimball (b. 27 Dec 1769 in Andover, Mass. – d. 06 Dec 1829 in Bethel, Maine) Israel’s parents were Asa Kimball and Hulday Tapley. Phebe and Israel had eight children born between 1795 and 1816 in Bridgton, Maine. Baptized at Boxford, Mass. 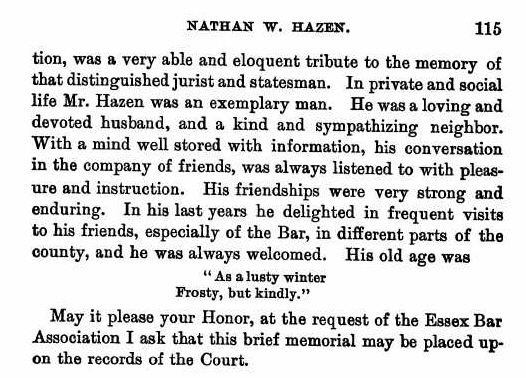 Jacob Hazen of Bridgton, Gentleman, as administrator of the estate of Josiah Hazen late of Bridgton, yeoman, deceased, by order of court Nov. 1806, sold Josiah Hazen’s land, for $1,000.00, to James Barker as the highest bidder at public vendue, deed dated 28 Jan. 1807. Margaret’s husband Nehemiah Jewett was born 25 Dec 1737 in Ipswich, Mass. His parents were Purchase Jewett and Ruth Todd. Nehemiah died 8 Nov 1815 in Ipswich, Mass. Nehemiah Jewett from Ipswich served three days in Capt. Moses Jewett’s troop of horse, which marched to Medford on the alarm of 19 April 1775. Nehemiah was one of the troopers who signed the following document Source: Ipswich in the Massachusetts Bay Colony, by Thomas Franklin Waters, Sarah Goodhue and John Wise. Published by the Ipswich Historical Society. i.Nehemiah Jewett b. 1768 in Ipswich, Essex, Mass; d. 2 Mar 1838 Pepperell, Middlesex, Mass; m. 22 Oct 1795 in Ipswich, Mass to Sarah Jewett (b. 1 Jul 1763 in Ipswich Village, Essex, Mass. – d. 12 Aug 1833 in Ipswich) Sarah’s parents were Moses Jewett and Abigail Bradstreet. iii. Abraham Jewett b. 25 Aug 1772 in Ipswich, Mass; d. 28 Jan 1858 Ipswich, Mass; m. 1 Jun 1800 in Rowley, Mass to Judith Matson (b. 23 Sep 1776 – d. 14 Mar 1860 in Ipswich, Mass.) Abraham and Judith had seven children born between 1801 and 1820 in Ipswich. This entry was posted in -9th Generation, Line - Miller, Twins and tagged Rowley. Bookmark the permalink.